R…Rajkumar First Weekend Box Office Collections were average. The movie was liked by viewers and increase in foot falls on sunday shows the growing popularity of the movie. R…Rajkumar was is an action romantic flick that released this friday. The movie was restrained from Critics’ good books however the entertainment factor which Prabhudheva served was much-loved by audiences. 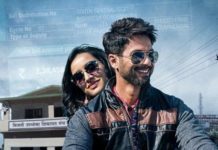 Sonakshi Sinha and Shahid Kapoor’s R…Rajkumar’s Weekend Collections were better than Bullett Raja First weekend Collections. Not only Bullett Raja, It also left Gori Tere Pyaar Mein and Singh Saab The Great also in terms of box office Collections. Stay Filmy and Have a nice week ahead !